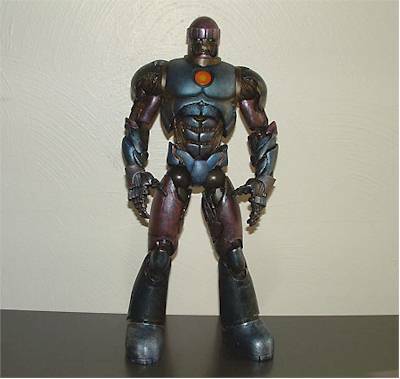 A long time friend of mine steps in with his first guest review tonight, and it's a great one - the Sentinel from the Marvel Legends series 10! Take it away, Aram! 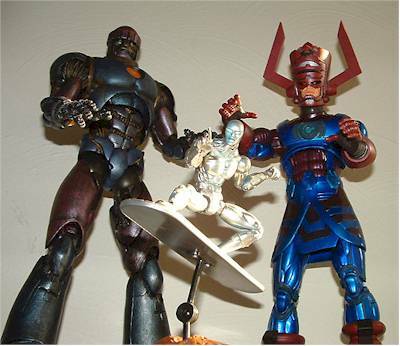 Marvel Legends series 9 started the concept of a bonus for collecting all the figures, that each came with a piece of a bigger figure, Galactus. It was a great idea and helped sell the line, even though some of the figures were more or less "B" characters. Series 9 started it, and now series 10 ups the ante! I have been looking forward to Series 10 for a while because it's more of an X-Men themed series. 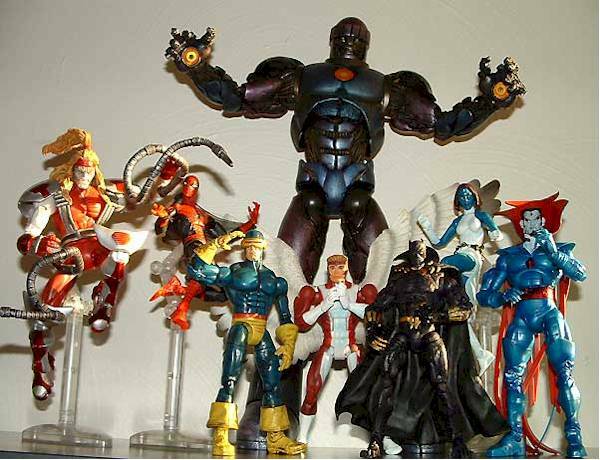 I started collecting Marvel Legends for the X-Men characters and this line has quite a few. I'm happy to see all of them finally in this form. 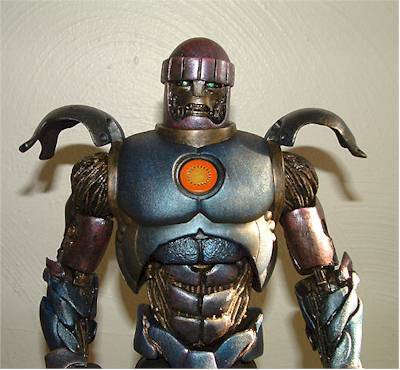 And just as Series 9 had Galactus, series 10 has...A SENTINEL! The big guy comes in 6 pieces with one body part in every package. There are 7 figures in the assortment but you only need 6 to build him (Omega Red and Mystique share the same torso part). So you don't have to buy ALL of them, but since this is mostly an X-Men themed line, it would made more sense for the shared part to have been with Spider-Man or Black Panther. Some people don't even know who Black Panther is and how many more Spider-Mans do we really need? They are all packaged very securely and the leg pieces especially really have some heft to them. I like the Marvel Legends packaging for the figures, and for the Sentinel, they show you everything you need to know about what you are getting if you collect all 6 to make him. It says at the top "Sentinel Series", and a big sticker on the front bottom right showing the Sentinel completely constructed with the piece that's inside highlighted. 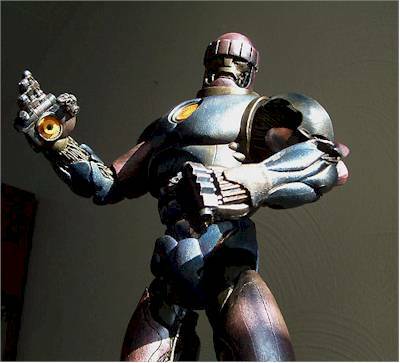 The scale of the Sentinel is clear in the pic, standing next to the figure you're getting. This behemoth is 16 inches tall! 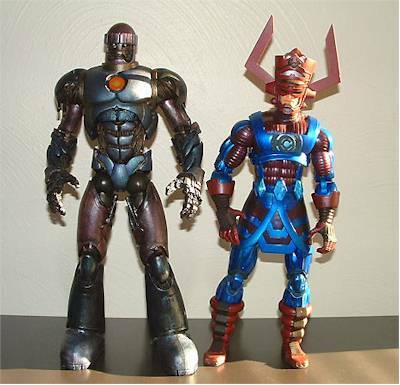 Marvel Legends hasn't changed the look of the packaging; you are familiar with what you are getting. However I do feel they should vamp it up a bit. There should be some kind of color code on the insert to let you know more quickly which series is which. When I'm somewhere like KB Toys, where they have the older Marvel Legends series, it'd be nice to be able to determine quickly if I need to waste my time before looking for that damn Dark Phoenix I missed in series 6! AMAZING! I think anyone who puts this bad boy together will be very surprised by the quality of the sculpt; I know I was. There is so much attention to detail. 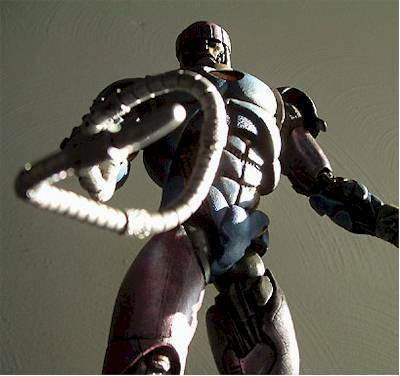 All the wires running in and out of the outer shell, around the knee caps, elbows, biceps, shoulders, torso, ankles, legs, and even around the mouth really make the figure look intricate and mechanized. Even the soles of the feet are sculpted with grooves and design that would make Nike jealous! There are many cuts and scrapes, mostly implied by the fantastic paint job, but looking closely, you can see that the only place where the injuries are actually sculpted are on his shoulder "caps" (which also raise to allow his arms to elevate). 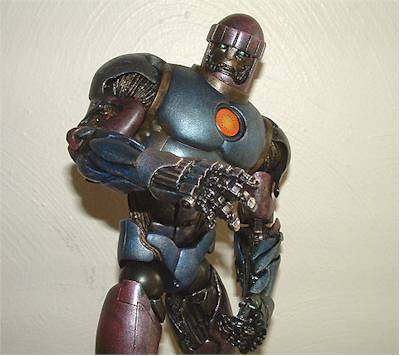 This is good because this figure isn't supposed to be a battle damaged Sentinel. We already have many pieces of those in the bases from series past. A touch like that really adds to the overall design and appearance. Everything is sculpted to perfection. I wouldn't change a thing. The sad part is, some people may only want a few of the characters in this line and end up getting maybe an arm or a leg. This figure really NEEDS to be boxed up and sold separately! I'm sure more than a few collectors will be buying at least a couple sets to have two of these 16" monsters lumbering over their collections...I know I will! AMAZING...AGAIN! Pictures don't do it justice...when you have it open and in your hands, the metallic paint job really catches the light. The purple and blues all blend beautifully, with accents of scrapes, wear, and age etched into the whole body. 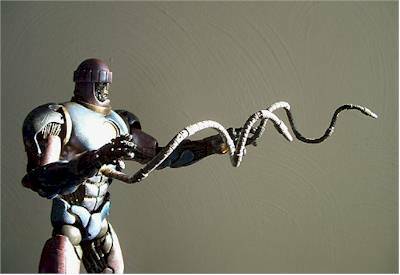 The wires are painted consistently running in and out of his outer shell. And fiery orange circles painted on his feet where his thrusters are match those in both palms and chest. His eyes are, of coarse, green, and he looks like he means business with that "don't mess with me" dead stare. UM...AMAZING! 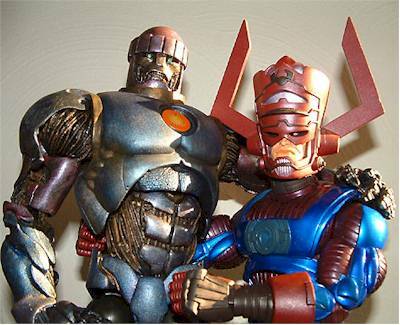 He's even more articulated than his pal Galactus because each finger is movable. I think the torso joint works much better also; it doesn't click into place and looks much better if you move it to the left or right for those morning toe stretches. He has a ball jointed neck joint (with limited mobility, but it gets the job done), double jointed shoulders and elbows, a joint for each shoulder "cap," ball jointed wrists (NICE touch), ball jointed torso, waist, double jointed hips and knees, ankles (which are very limited, but do help him to stand well), and ten fingers that move individually. WHEEEEEEE! If I'm having this much fun with him, a kid's gotta love him too or I'm just plain crazy. If I was five again, I'm sure he'd be sharing that special place on my pillow when I went to bed (which was normally only reserved for He-man and Gonzo). CHA-CHING! Well, if you paid about 8 bucks as I did for each figure, times 6, that's 48 bucks plus tax. Now sure, he may not be worth that much...but if you count that you are getting 6 great figures with that...it's a great deal! You can't buy him seperately (except maybe on Ebay), so for all you get, you can't beat it. PERFECT! It's truly a nice action figure. 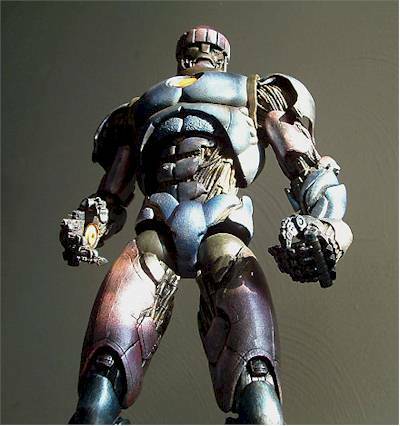 Every little detail, from the intricate design of the sculpt to the outstanding metallic paint job, addus up to a perfect score and...a perfect toy! This will really set a standard from Toy Biz. - YouBuyNow has preorders up for all of series 10 still at $10 each including Mystique. - CornerStoreComics has series 10 in stock for $10 - $13 each. 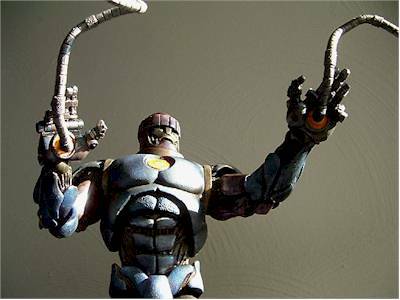 - Yikes Comics has the set of ML 10 for $70, or you can just buy the Sentinel for $70. - Amazing Toyz has most of the series for $10 each. Figure from the collection of Aram.